The cleared construction site at Allhallowgate. Image: Google Maps. It has been recommended that a block of new council-housing proposed for Ripon be designed with foundations and "escape paths" aimed at withstanding a sink hole up to 20 metres in diameter. 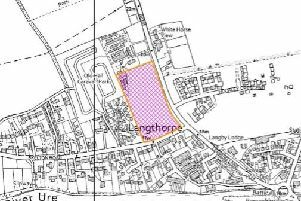 Permission for a raft of development on Harrogate Borough Council-owned land at Allhallowgate and Finkle Street in Ripon was initially approved in 2015 and 2016. But the matter returned to the planning committee in February this year with some variations to the design originally proposed. The new plans provide 18 new build units, consisting of town houses either side of a centre block of one-bedroom flats. In explaining the variations to committee members at the March 26 meeting, Harrogate Borough Council's agent said the "need for changes arose due to greater awareness" following further investigations into ground stability at the site. He added the council had found a “foundation solution which would accommodate the occurrence of a 20 metre sink hole beneath the new construction". “The probability of this is very, very low but we can not discount this,” he said. He added that the new design includes "spreading the preferred loadings” of the new buildings, while "concentrating a high proportion of the load in the centre of the dwellings", where the new build of 12-flats will be. “Development therefore consists of two, two-storey town houses either side of the cluster,” he said. The ground situation is further detailed in a series of ground stability reports which were done in 2018, but only uploaded to the publicly-viewable planning portal in March this year. A report by architecture and engineering firm William Saunders, dated December 2018, proposed that an "escape pathway" be included in the design. "This will enable occupants to escape from the building if a sink hole were to form beneath or close to the external landscaped areas," the report states. "During the escape, the occupants and emergency services could utilize these external paths in order to move along the front of the properties and onto the stable ground at the side of the sink hole." The firm's report stated they "found a solution in terms of the necessary foundation design that will ensure that the building’s occupants can escape from the building after the formation of a sink hole beneath or adjacent to the foundations". Another report, prepared by consultants Opus in June 2018 and reviewing earlier ground investigation work, recommended "a raft/span foundation solution with extension beams is used that is designed to span a 20m sink hole". The report stated "ultimately this is the clients decision as to the level of risk they are willing to take in relation to the potential size of a sink hole that may occur" and that "it must be stressed that all of the potential options generally carry risk...". The Opus report also highlighted a "circular feature" about 1.3m in diameter and in the order of 0.5m deep on the site. The report stated it was impossible to determine whether the feature was sink hole related, or perhaps related to collapsed sewers on the site. While the new design is meant to mitigate those risks, planning committee members also heard other concerns about the design and make-up of the proposed housing. One community resident addressing the committee said she was concerned about the social housing making the area "a slum again". She said the former social housing at the site, which has since been knocked down, was "filled with young men who were hell-bent on anti-social behaviour". She said nearby residents "suffered through three years of doors being kicked in at 3am in the morning, drinking, shouting and fighting" as the block “became a ghetto for drug taking". “We work hard and we’re proud of our area, we just don’t want to see it become a slum again," the resident said. The council's head of housing and property, Madeleine Bell, responded that there was no evidence that flats lead to more anti-social behaviour than houses. She also said council now has an antisocial behaviour officer, adding: "Our response to anti-social behaviour is much more proactive than it was five or six years ago”. Prior to the March meeting, the redesigned figures had come before council in February - with councillors demanding a redesign to reflect the surrounding heritage buildings. Councillors grudgingly agreed that the updated design - which included the buildings' heights being broken up, and dormer windows installed - was more acceptable. “I have to say its a lot better than the previous one," Coun Stuart Martin said. It was enough for his fellow councillors, who voted unanimously to approve the variation.